Poster commissioned from the South American competitive TF2 league Chapelaria for the launch of Season 3. A concept was shown to me from the commissioner of the 4 generalist classes of 6v6 jumping towards a medal in the center, and from there I knew what to do! 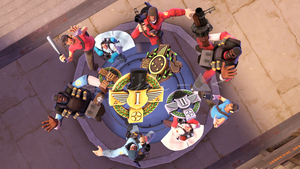 I like how you've got a 4v4 situation going on with the classes, I was thinking about putting at least one more Scout or Soldier in for my version! I'm guessing that you were the original concept though, so I'm going to credit yours in the description.